Nikolai Vasilievich Nevrev began his career as a successful portrait painter; later, a large number of genre paintings were added to his works, in which the artist particularly excelled. In maturity moved to the historical genre. Contemporaries of the author said that the paintings of Nevrev can study the entire Russian history. On the canvas “Oprichniki” depicts the moment before the execution of the boyar Ivan Fedorov-Chelyadnin. Boyar was famous for his military campaigns, but in the court intrigues did not participate. Despite this, was considered one of the most influential people, was very close to the king. Everything changed after the appearance of the oprichnina. Fedorov-Chelyadnin lost his influence on Ivan the Terrible. Gradually, he fell into disgrace and was even suspected of treason. Grozny ordered the boyar to appear in the throne room, where he forced him to put on royal robes and sit on the throne. After knelt in front of his faithful servant, and the first stabbed with a knife sentenced to death. 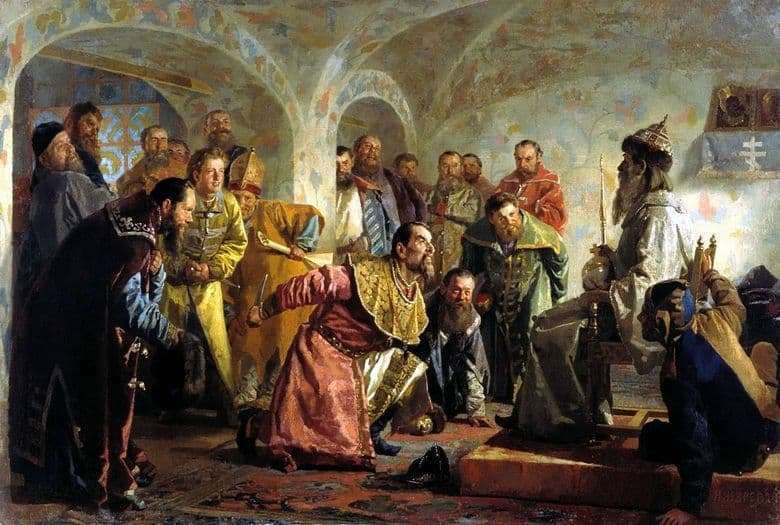 Ivan the Terrible in the picture Nevrev took his right hand far back, squeezing a dagger. His face is distorted by anger. All color accents converge on the figure of the king. His richly embroidered, bright clothes are lavishly decorated with gold, sun glare is played on his face and clothes. Fedorov-Chelyadnin, on the contrary, is in the shadow, his expression is difficult to make out. With trembling hands he compresses the scepter and the orb, keeps his back straight, preparing to accept his death. Notable facial expressions of numerous servants of the king. Most of them are pointedly obsequious, many bowed their heads submissively, trying to appear lower. Those who stand far away and are not in close proximity to Ivan the Terrible, frankly laugh. The artist perfectly managed to convey the drama of the situation, the intensity of passions prevailing in the throne room.